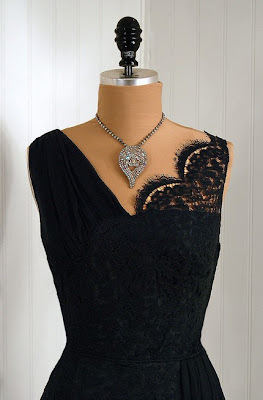 I just stumbled across this to die for little black vintage cocktail dress! If I owned it, I think I would live in it! What about you- where would you wear it to? I'd wear it to go shopping, just because I could. You are exactly right about this dress being timeless. I would wear this anywhere, flats for casual or foo-foo shoes for dressy! It would be too pretty to just hang in a closet for just special occasions. I would wear it to my husbands birthday party which is coming up soon, except I already have two dresses lined up, both saying 'pick me' so I better not be greedy, It is a stunner tho. That dress is absolutely stunning. Like, take your breath away. I would wear it to any opera because it deserves an event of that kind. I would wear it for a night out! FUN! I would wear it for tea and feel decadent! Tiffany's, with a croissont in my hand. The PTA board..... just cuz.... :O) Love it! Isn't vintage always in? No. The answer is NOOO! But! This is lovely like you said and it'll always be in. I'm def a dress wear-er and I'm always looking for new ones to add to my collection! wow this is so gorgeous! thanks for sharing! oh my! i absolutely love this dress. i would wear it with my back-seamed stockings and heels and run around the house in an apron dusting and cooking for my family...oh so june cleaver!